Characterization of kidney cancer–derived mTOR missense mutations. (A) Amino acid positions of mTOR missense mutations identified in ccRCC (TCGA_KIRC and RECORD-3). Numbers in parentheses indicate number of patients with mTOR missense mutations versus total number of patients sequenced (2 patients in the RECORD-3 study carry 2 different mTOR mutations). (B) Diagram shows the domain structure of mTOR, its regulatory interaction partners (negative regulators in pink, positive regulators in green, and a dual-role regulator in gray), and the substrates of mTORC1 complex. The positions within mTOR that are involved in the interaction with the regulatory partners are highlighted below the domain structure. The thickness of the horizontal bar of RAPTOR-mTOR interaction indicates the relative binding affinity. mTOR missense mutations derived from ccRCC are mapped and color coded to summarize their respective effects on mTORC1 signaling (activating mutations in red). KD N, kinase domain N lobe; KD C, kinase domain C lobe. 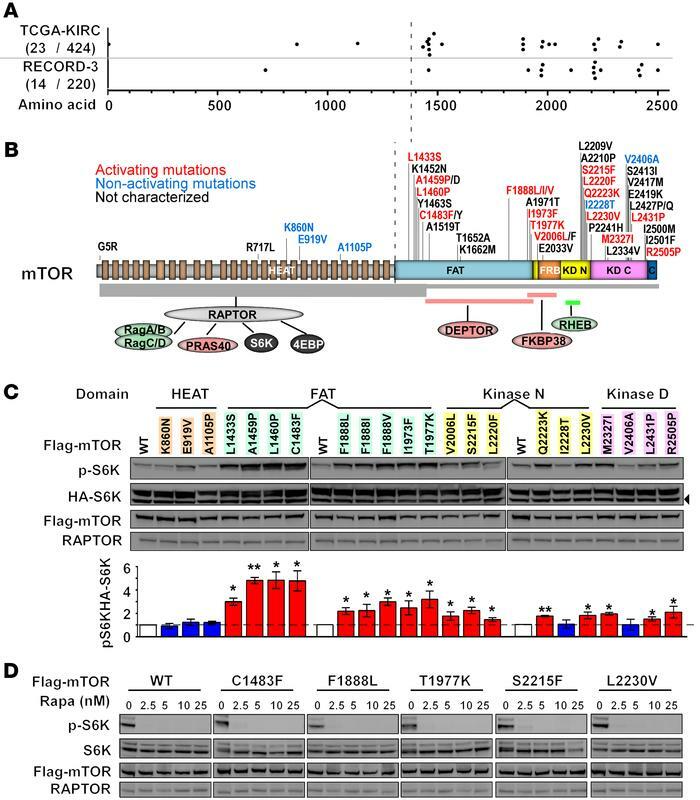 (C) Most of the mTOR mutants in the FAT and kinase domains induce higher levels of S6K phosphorylation (T389) than WT mTOR. 293T cells were transfected with vectors expressing HA-tagged S6K and Flag-tagged mTOR. Forty-eight hours later, cells were lysed and whole cell lysates were subjected to immunoblot analysis using the indicated antibodies. Densitometry of phosphorylated S6K versus HA-S6K from 3 independent experiments is shown (mean ± SEM, n = 3 independent experiments). *P < 0.1; **P < 0.05 (t test). The arrowhead denotes a cross-reactive band. (D) All mTOR mutants tested are sensitive to rapamycin treatment. Tetracycline-inducible HeLa cells expressing WT or mutant mTOR were treated with the indicated doses of rapamycin for 1 hour prior to immunoblot analysis using the indicated antibodies.